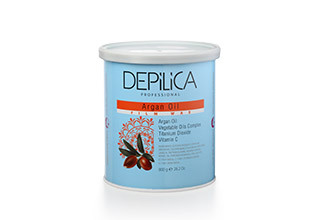 SPA-procedure of epilation based on argan oil developed exclusively for Depilica Professional to transform routine epilation process into pleasant procedure. Argan oil is known to be “Berber’s gold”. It consists of desaturated fatty acids for 80%, about 35% is linoleic acid rich with vitamins, natural oxidants and serines. 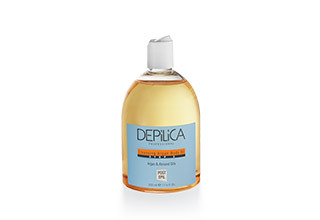 Due to its unique composition argan oil effectively copes with such drawbacks as skin dryness, dehydration, redness, loss of elasticity, and flexibility. It has strong anti-inflammatory, restoring and wound healing action that is especially important in epilation procedure. It makes procedure more delicate and quickly eliminates feeling of discomfort, it also provides skin with good tonus and health along with post epilation care products of “Argana” line. 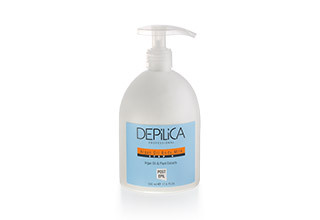 It is recommended to use Cleansing Lotion (Step 1) from Base line to prepare and purify skin before the procedure. 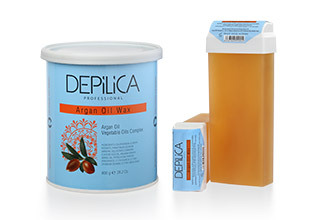 Argan oil wax has translucent flexible texture with glittering golden particles. At its heating air slowly fills with harsh fragrance dipping you into the relaxing orient atmosphere. SPA-procedure that exercise effective action on physical level, as well as emotional level.